At a time when Israel promised that a buffer zone would be set up in the south of Syria, Turkey is in the same manner talking about setting up a buffer zone in northern Syria. Both announcements are linked to one another. These initiatives constitute as an attack on the Syrian territory and its sovereignty. If Turkey considers the security and stability of Syria, it must end these kinds of provocative acts. 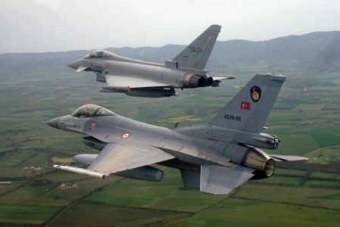 The Obama administration is also stating that it is open to the possibility of establishing a “no-fly zone” over Syria. Turkey has been whining and groaning for some time over an influx of Syrian refugees as a result of a humanitarian crisis that it helped create with its support and facilitation of Islamic fundamentalist death squad forces funded by the West and allowed to travel into Syria through Turkey’s borders. The most recent influx of refugees came from the city of Kobani, where ISIS fighters were herded by American airstrikes for the purposes of reinforcing the fighters already battling Kurdish and Syrian forces there. It is important to remember that the U.S. airstrikes and its attempts to create a “buffer zone” inside Syria are nothing more than a farce. The death squads running amok in Syria are themselves entirely creatures of NATO and they remain under NATO’s command. The true enemy of ISIS, Khorasan, and the cannibals of the Levant has always been and continues to be Bashar al-Assad. For those of us who have tried to warn of and prevent a direct military intervention in Syria, we must now redouble our efforts. Time is growing short.